The Pro-Gauges controller makes it possible to interface your computer with a wide range of real car instruments, through the USB port. The picture above is the configuration section for the rev counter. the signal wire from the rev counter must be connected to the RPM terminal on the Pro-Gauge. the power and ground wires connect to the 12V and GND terminals respectively. Enable the Pro-Gauge output that will drives the rev counter, clicking the checkbox marked with 1 in the picture above. In the section marked with 5, set the maximum value of RPM for your specific rev counter. There are 21 sliders in the Rev Counter configuration screen.. Each slider has to be adjusted until the needle of the rev counter indicates the value displayed on the TEST button, between brackets). For example, in the picture above, the slider marked with 3 has to adjusted until the rev counter display the value 1.000 RPM. For fine tuning, the UP and DOWN arrows of the numeric textbox marked with 2 can be used. The configuration section for the speedometer is in the picture above and is very similar to the one for the rev counter. Each slider has to be adjusted until the speedometer displays the speed value shown on the TEST button, at the right of the slider. In the picture above for example, the slider marked with 3 must to be moved until speedometer displays the speed 30 Km/h. The section marked with 5 indicates the speedometer's maximum speed value. The signal wire from the speedometer connects to the controller’s terminal marked with SPD. The 12V and ground wires connect to the 12V and GND terminals of the Pro-Gauge. The gauges indicating water and oil temperature, fuel level and pressure and oil pressure must be configured in the section displayed ain the picture above. There are 5 sliders and each one has to be adjusted until the needle of the gauge moves to 0%, 25%, 50%, 75% and 100% of the range. The section marked with 5 in the picture above is used to set what type of data is displayed by the gauge, the unit the data is displayed in and the minim and maximum values of the gauge. For each of the S1…S6 connectors there is a jumper on the board that can be moved to 6 different positions (see picture above). POSITION 1 is the default position and should be tried first when adjusting the 5 sliders in the gauges configuration screen. In any of these cases, move the jumper from POSITION 1 to POSITION 2 and try to configure the gauge again. If the same problem happens again, move the jumper to the next position and so on until you have tried all 6 jumper positions. The higher the jumper position the more accurately the needle can be positioned. On the other hand when the jumper position is increased, the range of the signal sent to the gauge is reduced, so it is a matter of finding the right balance between signal range and accuracy. If after you have tried to move the jumper to all 6 possible positions you still can’t configure the gauge, have a look at the section below that talks about the Signal Adapter. The signal wire from the gauge connects to the S1…S6 terminals of the controller (one of them). the 12V and ground wires from the gauge connect to the 12V and GND terminals. The signal adapter should be used if the needle of the gauge doesn’t reach the MIN or the MAX positions of the gauges, when you move the sliders in the configuration screen. Move the jumper on the Pro-Gauge board to a position where you are able to move the needle of the gauge, when you adjust the sliders in the configuration screen. It is ok if the needle doesn’t reach the MAX position of the gauge.Choose a position for the jumper as low as possible. So if both positions 1 and 2 make the needle move, prefer position 1. Move the needle to the maximum position you are able to. Don’t push the slider all the way to the right but stop when the needle can’t move any higher. Connect the signal adapter to the gauge (see instructions below) and adjust the blue potentiometer using a screwdriver. The process is a bit trial and error but when you adjust the potentiometer at some point the needle of the gauge should start moving. Keep adjusting the potentiometer until the needle reaches the gauge’s MAX position. Go back to the Pro-Gauge configuration screen and adjust the sliders. If now you are able to move the gauge’s needle all the way from the MIN to the MAX positions, you are done, otherwise you will have to keep playing with the potentiometer and possible with the position of the blue jumper on the Pro-Gauge. The potentiometer of the signal adapter can be turned 15 times to the left or to the right. When you reach the start or the end positions the screw doesn’t block but you should be able to hear a click, from the potentiometer. That means you have turned it all the way, and keeping turning it doesn't produce any effect. - The G terminal connects to the gauge’s signal wire. One signal adapter is included with the Pro-Gauge but more can be purchased separately if needed. 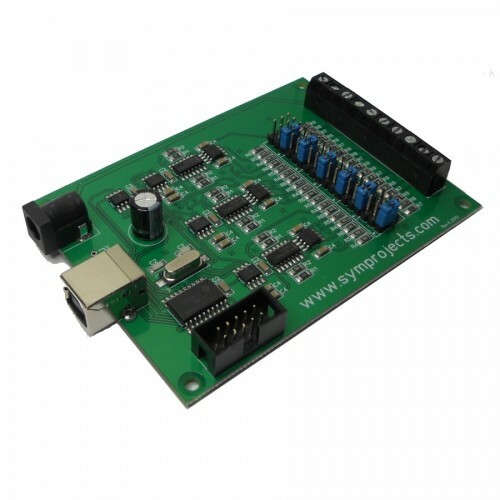 The signal adapter is a small board that is used to make the Pro-Gauge controller compatible with a .. This tachometer offers extremely fast movements. The main features are:It uses high precision ..